Of a lunchtime, you can see them, the BT drones, gliding along the well-worn path out from Adastral Park, right along Gloster Road and down to the big Tesco. Some will take a brief detour to purchase pet supplies. Others will gawp at the gadgetry in Bennetts. Yet all will return along the rut clutching their biodegradable meal deal bag. As of April 2013, a new offshoot may well form. 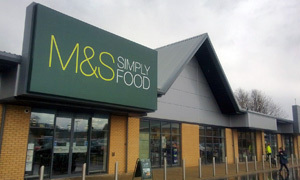 Lo & behold, ladies & gents, M&S has sprung up in Martlesham Heath (Glasswells was here before moving to Ipswich). However, don't go there looking for undies or slacks. This is Simply Food. And, to judge by that crammed car park -- and much like Thomas Hardy's novel writing -- the crowd are loving it. Soggy day, but less than five mins on the bikes: wot no racks? Cafe occupies the bright and cheerful windowed area to the right in an infernal L-ish shape. Too tardy for the breakfast bloomers -- bit like McD's, they stop on the dot of 11:30am -- so it's soup or sarnie. Since I'm paying the best part of £7 (!) for my pre-packed chicken and peppers toasted sandwich + crisps + OJ, it better be good. Yep, sure is. Every table's taken with oldies and/or mums and pre-schoolers. Yet somehow there's barely a queue -- are you listening, Mr. Waitrose? Most pleasing cake selection, from fresh pastries to buns-to-go. Since we're here in an official capacity, I'll splash some more cash on some of that there carrot cake. Andy's heard of a prize winning barista lad on these here premises. I think that's him, Charlie, stacking plates while a trainee girl spills my OK-looking flat white. Still goes down v. well with the slab o' cake. In what I'd hazard is a limited offer, it's help yourself to a Percy Pig, too. So, pretty good coffee is now to be had at M&S and Next Costa, equidistant from the workplace. Both have loyalty cards. It's a problem I'm happy to have. If it was a car -- Jaguar Mark IV. If they were passing by -- Rosie Huntington-Whitley.